The banks of Yarra River in Melbourne, Australia are an ideal place to look at the city. I was walking along Yarra on a winter day and this post shows you the views. Most Melbourne sights are along the river so you can see them all on a half-day Yarra River walk. Yarra River in all is 242 kilometres long. It flows from the green Yarra Ranges to Yarra Valley and on to Melbourne and from there down to the sea. There are nice walking and cycling paths all the way but I think the Melbourne walk is the prettiest of them all. I like Melbourne! I spent half a day on my little Yarra River walk through central Melbourne, starting at Southbank and walking towards the Royal Botanic Gardens. My trip to Melbourne happened to be in August which is mid winter in Australia. Beforehand I was a bit worried what Australian winter weather is like. Most people told me it will be cold and stormy. Yes, it was cold, but it was sunny and clear skies most of the time. So I went out and walked a lot while my husband Clas spent his days in meetings in the Southbank Convention Centre. The winter air was cool and clear which makes all colors real strong. The Australian sun is strong all year round and even in winter you will get amazing colors in your photos. So I made a gallery of the photos I took walking along the Yarra on a sunny winter day. As you might know I normally prefer nature photos but Melbourne became an exception. Yarra views made me so inspired of city life and I saw so much beauty in skyscrapers. So river views and skyscrapers make a great combination – this is Melbourne, Australia! This Yarra River walk begins at Southbank which is the area south of the Yarra river. Southbank used to be an industrial area until the 1990s when high-rise office and apartment buildings started to be built here. From the bridges and the north bank of Yarra you get this kind of nice views across the river to Southbank. Southbank is mainly a business area but also an entertainment and restaurant district. The dining terraces here face north and get afternoon and evening sun. No wonder crowds of people are sitting here on the heated terraces despite it is in the middle of the winter. Here you can see the Southbank Promenade that stretches all the way from the South Wharf to St. Kilda Road. From there you can continue walking further all the way to the Botanic Gardens. The park that begins in Alexandra gardens and continues to the Royal Botanic Gardens is a perfect jogging area. A magnific place to jog right in the middle of the city! This is Yarra, right in the middle of Melbourne. The walk from the Convention Centre to Royal Botanic Gardens made 7 km one way. I mainly walked on the south bank. If you walk two ways you can return along the other side for different views. 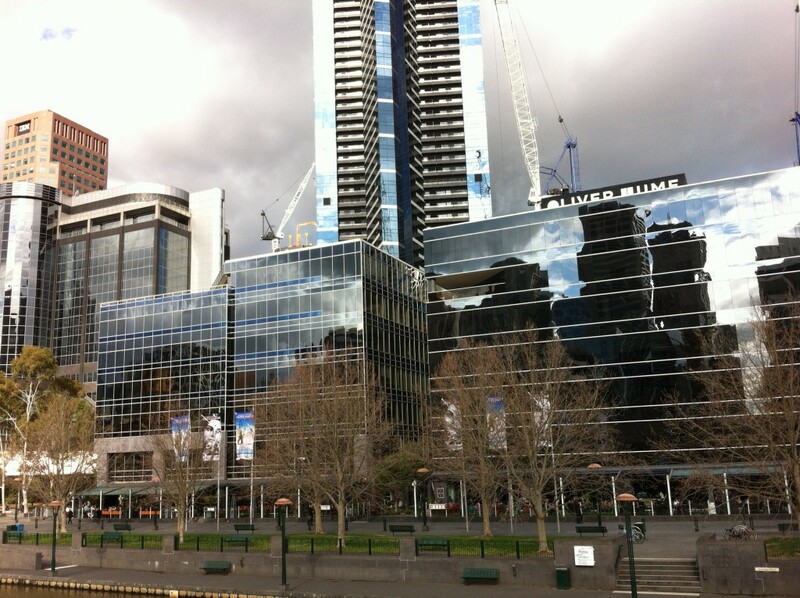 This is the huge complex of the Crown casino and entertainment centre on the south bank of the Yarra. This casino is one of the largest in the world. There’s not just entertainment but also a shopping section. Next to the Crown complex is the Melbourne Convention and Exhibition Centre that hosts thousands of exhibitions. Also the convention we were here for was arranged here. Right behind the Convention Centre is the Hilton Melbourne South Wharf Hotel where we stayed. The Hilton hotel was directly connected to the Convention Centre through an indoor corridor which was practical. And right behind Hilton comes the huge DFO South Wharf outlet shopping mall that had massive discounts of fashion clothing and other quality products, more than 100 shops. The South Wharf area has lots of great dining options too. Returning from South Wharf you’ll come to Eureka Tower that was completed in 2006 and it is the highest building in the southern hemisphere. It has as many as 91 storeys. This modern blue glass building with white stripes has a historical background and there are many symbols in it. The gold crown at the top represents the gold rush in the 1850s and the red stripe represents blood that was spilt in the Eureka Stockade which was a revolt during the gold rush. If you want a real walk experience on the Eureka Skydeck 300 meters above the city look at these pictures on the Skydeck website! This is Southgate, another restaurant centre that has a riverside food court and lots of other nice dining options. In addition Southgate is a shopping mall. And Southgate is the starting point of Yarra river cruises. There are many bridges crossing the Yarra River so you can always cross the river when you start feeling like that. This is one of the footbridges, called Queens Bridge, and this is the one leading to the Flinders Street railway station. Some of the Yarra bridges have been railway bridges in the past. This promenade is called Flinders Walk and in the background is another bridge, the Princes Bridge. Behind Prince Bridge is a popular riverside pub, the Riverland Bar. Princes Bridge is very pretty in winter light, with brown river water in front and approaching clouds in the background. Here are some photos of the bridge. The bridge brings you to the Central Business District and Federation Square. Federation Square is Melbourne’s most popular meeting place and an events centre. The complex was built in 2002 and the architecture is stunning. In addition to the events complex there are restaurants and cafes. Down the stairs in the middle of the square is the excellent Melbourne Visitor Information Centre where you can get all tourist information on Melbourne you’ll ever need and you can also buy event and tour tickets and Myki cards (tram and bus cards). There are always lots of tourists and school groups strolling on Federation Square and of course locals hanging out. Melbourne has a good tram network and taking a tram is easy and within the CBD it’s free so you don’t have to bother about the tickets. For longer journeys you need a Myki card. Tram stops are always at traffic lights which was new to me but it’s so practical. The trams don’t have to stop to take passengers between different traffic lights and once again at the next traffic light, there’s just one stop. This is the Atrium, a very special galleria-like structure. It’s made of glass, steel and zinc. The Atrium changes colour at dark, from green to blue and to purple and pink. Across Flinder’s Street you can see this old church, it’s the St Paul’s Cathedral and and some other remarkable buildings like this Venetian-style house. Federation Square is also home to the Ian Potter Centre that is part of the National Gallery of Victoria. The entrance to most of the exhibitions is free, just enter and enjoy old and modern Australian art! The Ian Potter Centre is dedicated to Australian art. There was a good exhibition of contemporary art where I spent a long time but the most fascinating exhibition was the collection of works by Aboriginal and Torres Strait communities that you can see samples of in these pictures. 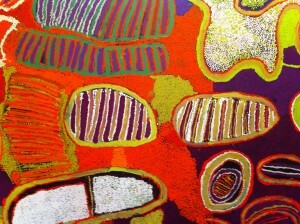 Aboriginal art is based on ancient stories and dot paintings are very typical. Aboriginal art is the oldest ongoing tradition of art in the world and it’s magnific how the tradition survives in modern art. These works of art are just great! But after all this dreaming it’s time to get out again. Flinders Street Station is at the corner of Flinders and Swanston Streets, right opposite Federation Square. The old yellow and red station building is a result of an architectural competition that was held in 1902. Flinders Street Station is the oldest railway station in Australia. Millions of commuters are using Flinders Street station and it’s said to be the busiest railway station in the southern hemisphere. Melbourne has a very good train network, there are more than 200 suburban train stations. This picture shows the CBD and Collins Street that still has many grand old buildings: theaters, churches and store and office buildings. Also the Melbourne City Town Hall that you can see in the middle of the picture stands at the corner of Collins Street. The Victorian buildings of Collins Street stand at the feet of all the modern glass and concrete skyscrapers that were built here much later. There are many trees in the CBD. They are needed to protect pedestrians from the sun that is very hot in the summer. In the winter there are no leaves so you get a better view of the buildings. 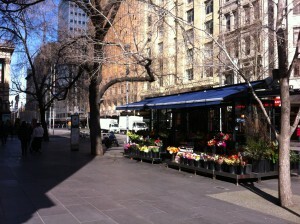 There are flower stalls on Swanston Street selling pretty winter flowers. Swanston Street is a pedestrian and tram zone. After spending most of the day in the city you might want to stroll a bit in the nature. Then head back to the Yarra River and follow it to the Royal Botanic Gardens where you can enjoy Australian vegetation from different parts of the country. You can stroll in a wetland area and in another place you can see different kinds of banksias. Banksias are common trees all over Australia and there are about 170 sorts of them. The flowers are pretty but when they dry up they look brown and ugly. So many things are different in Australia. Even the swans are black and not white like in Europe. In the Royal Botanic Gardens of Melbourne you can walk along a stream along winding paths and boardwalks and imagine you’re in a tropical rainforest, not in a city of four million people. There are places you can sit at or you can just wander around in the fern gully landscape. Acacia, or wattle is another common plant in Australia. Eucalyptus is the most common plant and after it comes the wattle. Wattles can be small plants or tall trees and they all are well known for their yellow flowers. Wattles bloom at all times of the year and especially in the winter. This looks like the spring in Europe. But in Australia it looks like daffodils are winter flowers. If you want to learn more about the Royal Botanic Gardens in Melbourne and in Cranbourne outside Melbourne, visit their website. This was a short city walk along the Yarra. If you want to walk along the river outside central Melbourne you can check out the route descriptions on the Only Melbourne website. If you want to know more about Melbourne sights see my other blog post Sightseeing in Melbourne. A big event in Melbourne is the Formula 1 Australian Grand Prix that’s held each the autumn. It’s a must to make a trip to the Great Ocean Road. Read my post Touring the Great Ocean Road.